If you’ve been following me on my Instagram, you will know that I switched to a CG friendly routine only recently. Before switching, the OGX Quenching Coconut Curls Shampoo and Conditioner line was one of my favourites. And yes, my curls were still hydrated (see cover picture for reference) & felt great! I do think that technique matters a lot & you can still get beautiful curls even if you cannot follow a pure CG routine. This review of the OGX Coconut Curls Quencher Shampoo & Conditioner is based on the experience I had when I was using them. Writing it now because many of you ask me if this is okay for your curls since it’s easily available online & offline in India. NO. It has Sodium C14-16 Olefin Sulfonate, Dimethicone & Amodimethicone. Wondering what is a CG Friendly routine & why it matters? Read this post. It may not have Sodium Lauryl Sulphate but Sodium C14-16 Olefin Sulfonate is a type of surfactant & behaves very like a sulphate. It can lead to dryness for some people. It has both of the silicones avoided by the curly girl community – Dimethicone & Amodimethicone which coat the strand to give softness. Unfortunately, the coating it provides can build up on your curls & will remain there until you use a shampoo with sulphates. NO. It has Dimethicone & Dimethiconol which are silicones and buid up on your hair over time. It’s got a lovely, thick, creamy consistency which makes it SO easy to detangle any knots! It leaves my curls feeling moisturised & soft. Great Fragrance-Big weakness for a coconutty smell. 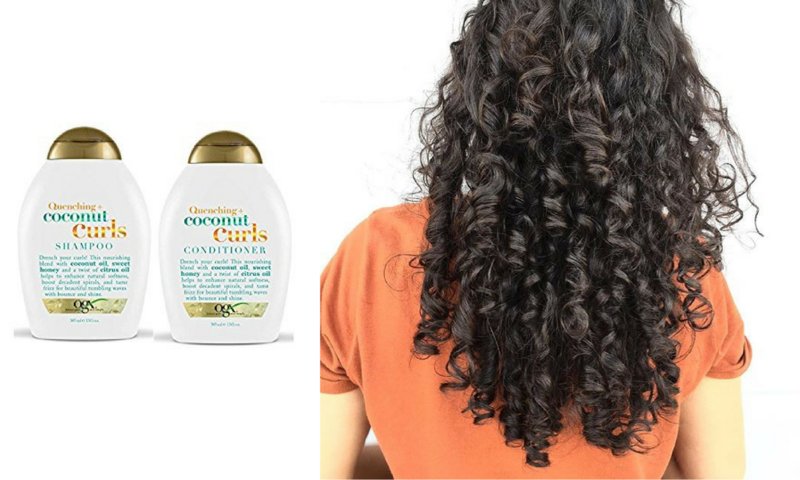 The first ingredient is water – this is important to give hydration to your curls. If you live in a city without extreme temperature & humidity, honey & Propylene Glycol will help maintain moisture balance. It has silicones! Dimethicone & Dimethiconol build up on your hair over time & can make them lifeless and dull unless you have a shampoo with sulphates in them. Cyclopentasiloxane & Polyquaternium-37 are CG approved but can still cause build up and many need a cleanser to remove. If you’re living in a hot, dry city, honey & Propylene Glycol will search for moisture in your own hair & leave it feeling frizzier. I have switched to a pure CG friendly routine & my curls have become bouncier & defined. Until & unless I switch back to a non-cg routine, will have to avoid products by Ogx! When I did use it, however, it worked well to cleanse my scalp & left it feeling soft (because of the cones). For people on a budget & who are not picky about your ingredients in your products, this is a good buy. I have MANY readers who are happy with this line. Some of them have noticed their curls get less volume and bounce with CG routine so they enjoy a little sulphate in their shampoo. You can buy it the shampoo here & conditioner here. Want me to review any other product? Drop a comment below! If you want more tips & tutorials, don’t forget to subscribe to my Youtube Channel & follow me on Facebook & Instagram! I was going to buy this but now I don’t think so.